The best tutorial I found comes from the French Etsy Blog. It's easy to follow with step by step photos. Images from the French Etsy Blog. Click here for the full tutorial. 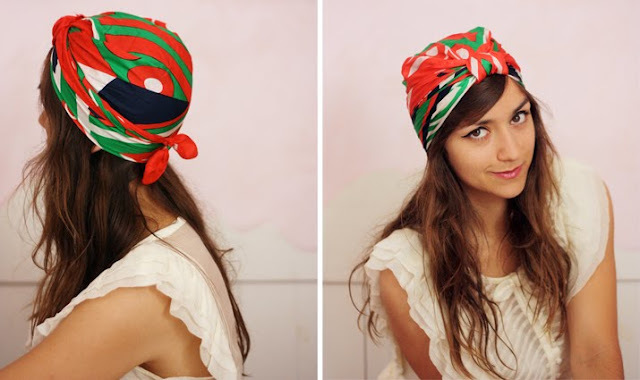 If you would rather follow written instructions, you can find another great turban tutorial here. So what do you think, will you try it out? Do you find it elegant, weird, ugly, pretty? I saw a girl wearing a vintage 1960's real turban and thought that maybe I would try it. I usually don't care too much for them, as I have been seeing a lot of them in the blogger world, but I adore this tutorial. Thank you! Great tutorial. This will come in handy for me on the beach! Thanks for sharing! Looks so cute! I dont know if I would be able to pull it off but I"ll definitely give it a shot. I love this! I have newly chopped short hair and so many vintage scarves. Perfect for bad hair days. ooh I love this! You know how I feel about turbans! Love it! I may have to try this soon! Lost my hair to chemo and received a large scarf as a gift. Thanks for this most helpful post. I have practiced and practiced typing this so that I can get to church on time sporting my new turban do! The funny thing is....black women wrap their hair up just like this every night! Lol When I saw the tutorial I was like "Oh I do this all the time!" Lol. Cute.